The phrase “going mobile” is taking on new meaning. Businesses are intently focused on being nimble, innovative and cost effective—without compromise. This premise rings true in what businesses demand from the next-generation data center. 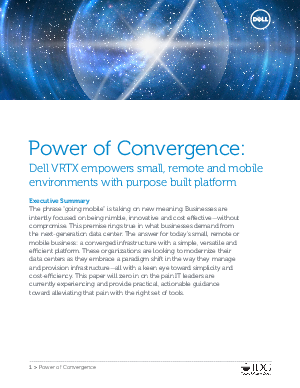 The answer for today’s small, remote or mobile business: a converged infrastructure with a simple, versatile and efficient platform. These organizations are looking to modernize their data centers as they embrace a paradigm shift in the way they manage and provision infrastructure—all with a keen eye toward simplicity and cost-efficiency. This paper will zero in on the pain IT leaders are currently experiencing and provide practical, actionable guidance toward alleviating that pain with the right set of tools.